The juicing trend is at an all time high and there are so many different combinations of juices to choose from. It can be quite overwhelming to know which juice you need and when. 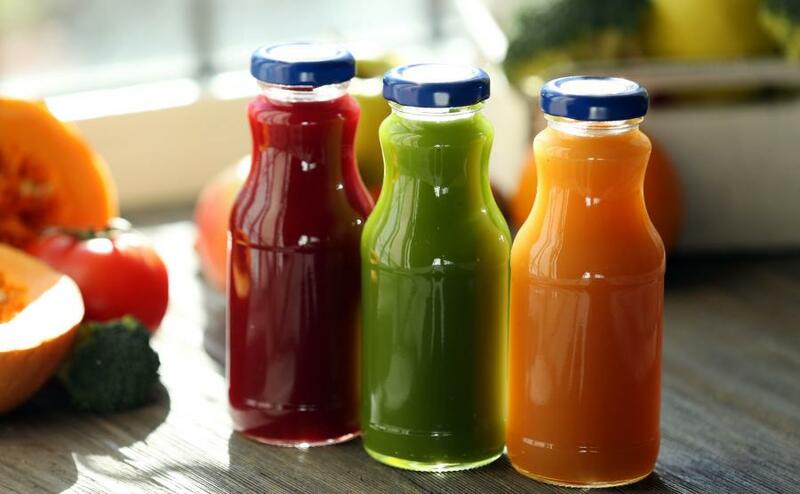 Cold pressed, organic, detox, cleansing, green, veggie or fruit – the options are endless, so it’s tricky to know what is best. Not to mention that the cost of a single fresh organic cold pressed, cleansing juice can set you back between $5-$10. This means that the average American, will likely not consume enough juice in one day to meet their recommended daily intake of fruits and veggies. So how can we maintain excellent health when juice is costly and our lives are far too busy to go through the effort of juicing at home? Juice Bar in a Bag is the answer! It is the best solution for families to get optimal, delicious nutrition in an easy, economical and convenient way. Your kids will love the flavors too! Now you don’t need to buy overpriced juices when you have your very own selection of dehydrated juices in a reusable bag. This raw rainbow collection offers over 50 organic vegetables, fruits and herbs. There is a blend for everyone with this personal on-the-go juice bar that has 6 different products that create over 50 drink flavors with 30 servings per bottle. Keep your family prepared for whatever comes up with a bag of on-the-go healthy nutrients in the form of easy and safe dehydrated drink mixes and some pure water. What if you had to flee a wildfire and got stuck in a traffic jam for many hours like what happened in the Paradise area of California? Your prepper bag is one small precaution that might help you survive a hardship or emergency. At least you could stay hydrated and nourished until safe. 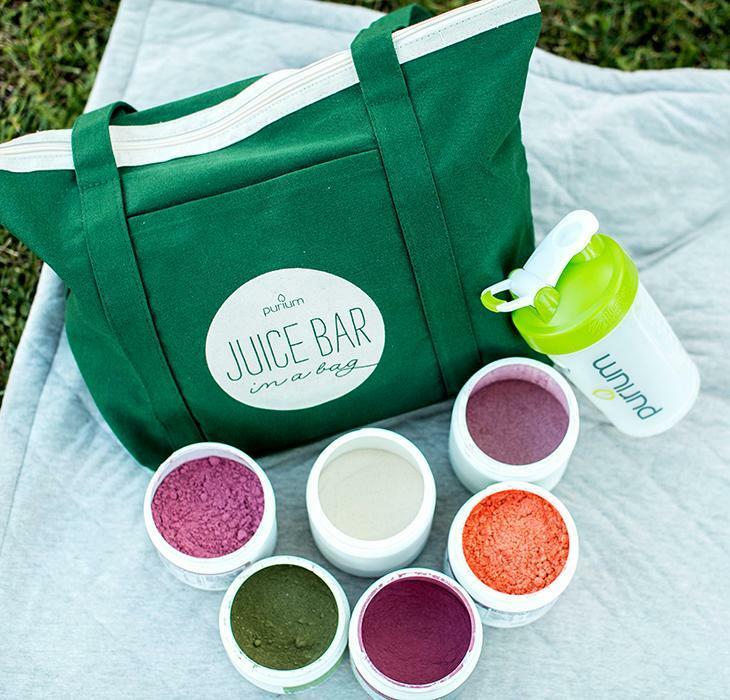 Keep your survival bag by the door, and take the Juice Bar in a Bag with you when you leave. You could just put one of the small containers of condensed superfood powder in your purse or backpack if you can’t take the whole collection of nutrients with you. Amazingly convenient and super easy to use! Even if you are just having a busy day around the house or at work, that bag of quick vital energy could save time, help you be more productive, and give you a clear head to perform your best. It’s a lifestyle and a way of thriving that you’ll love. Ingredients: Organic Coconut Water, Organic Coconut Sugar, Organic Hibiscus Flower, Organic Coconut Oil Extract Powder, Organic Ginger Root Powder, Organic Brown Rice Extract, L-Malic Acid Powder, Mineral Salts (Calcium Carbonate, Sodium Bicarbonate, Potassium Bicarbonate, and Magnesium Carbonate), Organic Raspberry Flavor, Agar Agar Powder, Organic Rooibos Extract, Organic Stevia Leaf Extract. Ingredients: Organic Beet Root, Organic Brown Rice Syrup Solids, Organic Lemon, Organic Coconut Water Powder, Organic Pomegranate, Organic Beet Root Juice Powder, Organic Brown Rice Extract, Organic Maca Root, L-Malic Acid, Organic Monk Fruit Extract, Cordy-Gen® Organic Cordyceps sinensis Mushroom, Organic Panax Ginseng, Organic Eleuthero Root, Organic Yerba Mate Leaf, Organic Rhodiola rosea Extract, Organic Moringa Leaf, Organic Guar Gum, Natural Flavors (Orange, Guava, Passion Fruit), Organic Coffeeberry® Whole Coffee Fruit Extract. Ingredients: Organic Carrot Juice Powder, Rice Bran Solubles. Ingredients: Certified Organic Alfalfa Leaf Juice, Certified Organic Barley Grass Juice, Certified Organic Oat Grass Juice, Certified Organic Wheatgrass Juice, Certified Organic Spirulina, Certified Organic Chlorella, Certified Organic Sea Kelp, Certified Organic Parsley, Certified Organic Broccoli, Certified Organic Cabbage, Certified Organic Kale, Certified Organic Dandelion Leaf, Certified Organic Broccoli Sprout, Certified Organic Dulse. Ingredients: Organic Coconut Water Powder, Organic Acacia Gum Fiber, Organic Pea Fiber, Organic Jerusalem Artichoke Inulin, Organic Brown Rice Extract, Organic Apple Flavor, Organic Lemon Powder, Organic Aloe Vera Powder, L-Malic Acid Powder, Organic Ginger Root Powder, Organic Stevia Leaf Extract, Lactospore® (Bacillus coagulans 15 billion cfu/g), DigeZyme® (α-amylase, protease, lipase, cellulase, lactase), Organic Luo Han Guo (Monk Fruit) Extract.